Highlands Community Charter School, founded in 2013, is authorized by Twin Rivers Unified School District and provides education for adult learners, 22 years of age and older, at no cost. 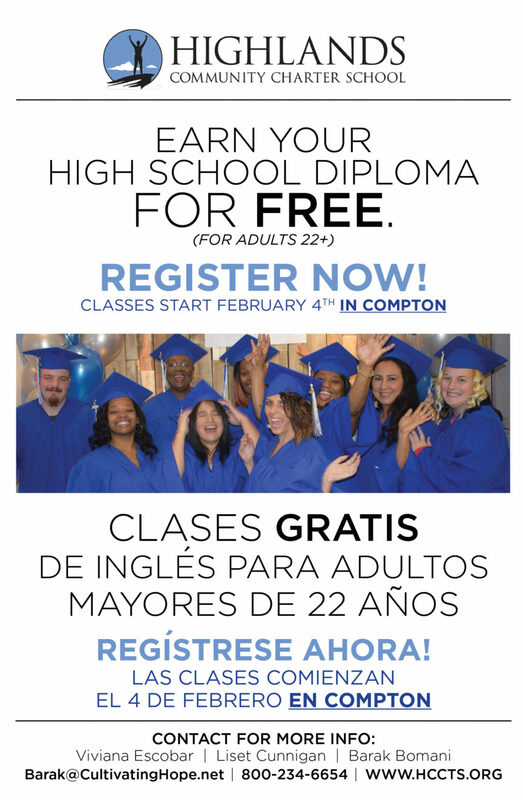 Our adult students are given a new opportunity to learn English, earn a High School diploma, receive technical job training, and take citizenship classes at one of our 24 campus locations in the California. Our newest campus is located in Compton at the Center for Sustainable Communities, 1051 Rosecrans Avenue 90222. Classes start at 5pm everyday Monday thru Friday. Please stop by for more information. We are especially interested in persons from disadvantaged or challenged backgrounds including but not limited to: high school dropouts, formerly incarcerated, illegal immigrants and non-English speakers. Once the adult students are enrolled into our high school diploma program, they become eligible for career and technical training as they finish their last graduation credits. Based on program offerings and local partnerships, career and technical training will be offered at no cost. Highlands is also seeking organizational partnerships that offer classroom space and access to adult learners who might be interested in attending school 25 to 30 hours per week in the morning and/or evening.